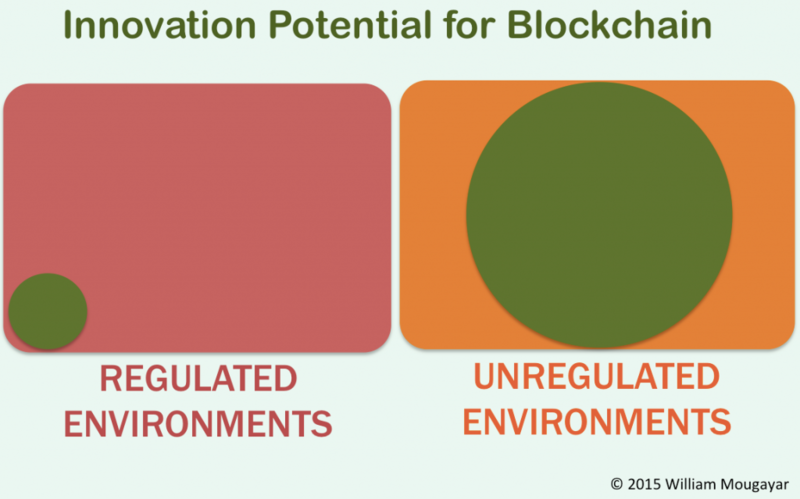 The discussions about permissioned vs. permissionless blockchains are masking a fundamental difference between the various possibilities in implementations of blockchain solutions, and it is rooted in the degree of innovation that is allowed. The default state and starting position for innovation is to be permissionless. Consequently, permissioned and private blockchain implementations will have a muted innovation potential. At least in the true sense of the word, not for technical reasons, but for regulatory ones, because these two aspects are tied together. We are seeing the first such case unravel within the financial services sector who seems to be embracing the blockchain fully, but they are embracing it, according to their own interpretation of it, which is to make it live within the regulatory constraints they have to live with. What they are really talking about is “applying innovation”, and not creating it. So, the end-result will be a dialed-down version of innovation. That is a fact, and I’m calling this situation- the “Being Regulated Dilemma”, a pun on the innovator’s dilemma. Like the innovator’s dilemma, regulated companies have a tough time extricating themselves from the current regulations they have to operate within. So, when they see technology, all they can do is to implement it within the satisfaction zones of regulators. Despite the blockchain’s revolutionary prognosis, the banks cannot out-do themselves, so they will guide the blockchain to live within their regulatory constrained world. Yes, moving assets at the speed of light and at the cost of pennies is a wonderful achievement; as compared to the speed of molasses, taxed by the overhead costs of bean checkers and slowed further by the breathing nostrils of compliance processes. But that’s probably where the “innovation” will stop within banks. And if you step back from it, all you see is going to be cost savings to back-end operations. A related blind spot is when regulated companies start to believe they can co-operate with regulators as “partners”, so they can develop innovative solutions together. Well, that is also a flawed conclusion, because innovation always emerges from outside of existing regulation. I’ve said this in my slides deck on the 2015 state of the blockchain in financial services: blockchain and old constructs, such as clearing houses and private exchange networks (e.g. SWIFT, CCP, FIX, DTCC) are like oil and water: they will not mix well because one is based on centrally trusted intermediaries, and the other is based on “no” intermediaries and peer-to-peer trust. I’m not sure how the banks could break free from that regulatory dilemma, unless they start something totally new. So the crux of the matter is they are a central body, and the blockchain doesn’t like anything with a central flavor. This message is not entirely directed at the banking sector, as I don’t want to pick on them in particular. This applies to any other sector that is regulated. Innovation always happens outside of regulation, and that message is worth repeating. The blockchain’s fundamental characteristics are puzzling regulators, central authorities and large corporations because it challenges centrally orchestrated trust, and enables a new kind of trust: one that is decentralized and not centrally controlled. If you want to look at true innovation with the blockchain, the common denominator will be that there are no incumbents in that equation. The innovation is happening within new white space areas. I’ve already written about this, in With Decentralization, Where is the Money? These new areas will include banking without banks, gambling without a house, title transfers without central authorities stamping them, e-commerce without eBay, registrations without government officials overseeing them, computer storage without Dropbox, transportation services without UBER, computing without AWS, online identities without Google, and that list will continue to grow. Take any services, and add “without previous center-based authority”, and replace by “peer to peer, trust-based network”, and you will start to imagine the possibilities. If you’re a center of something, you live within the same dilemma as being regulated. If you can’t break free of your center-based services, the blockchain is not for you.